The OK Fencing Club’s main event is an annual match against the School on Commemoration & Governors’ Day each June, usually including foil, sabre and epée matches. This is an opportunity to keep in touch with contemporaries and other OKC fencers. 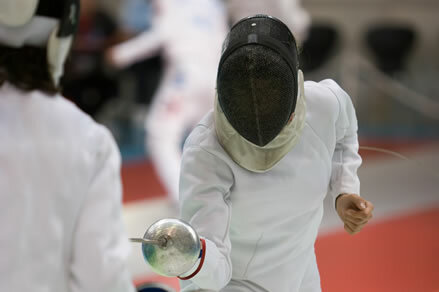 Many OKs continue fencing at University and beyond and often meet up at competitions and clubs. The School Fencing Club operates on Saturday mornings during term time and OK’s are welcome to attend, subject to approval of the organiser. Fencing news from OKs is reported in the OKC newsletter. Nick Perry (OK 2006) has been selected to fence for Great Britain in a World Cup Epee event in Tallin, Estonia 14 -16 November 2014. Jonathan Bradley (OK 2004) has been selected to represent Northern Ireland at Epée in the Commonwealth Fencing Championships in Largs, Scotland from 10 -15 November 2014.